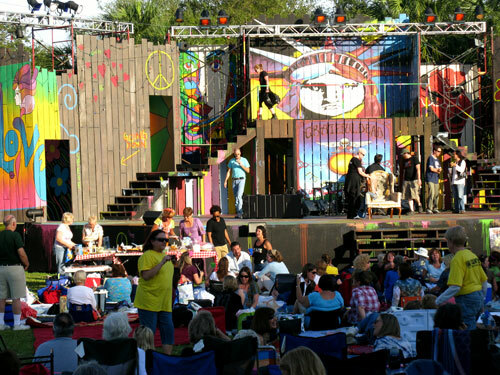 American Stage In The Park, celebrated its 25th Anniversary in St Petersburg FL with the rock musical, HAIR. 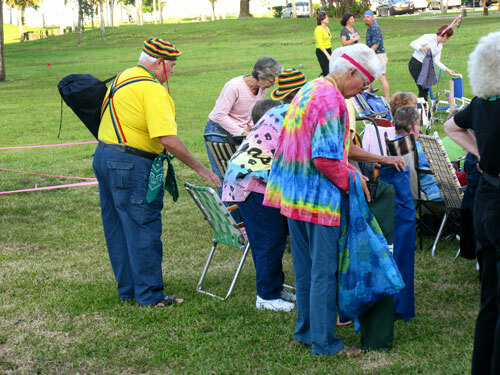 Demens Landing Park looked like the assisted living bus pulled up for a love-in. 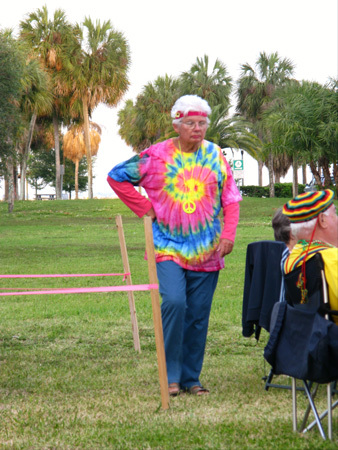 This is the fourth year we have attended the annual springtime theater under the stars production in downtown St Pete, and we came away...confused. I guess HAIR has that affect on most people who attend. We got to Demens Landing Park (on the southern end of the St Petersburg Waterfront Parks system) about an hour early because we figured this would be a heavily attended play. 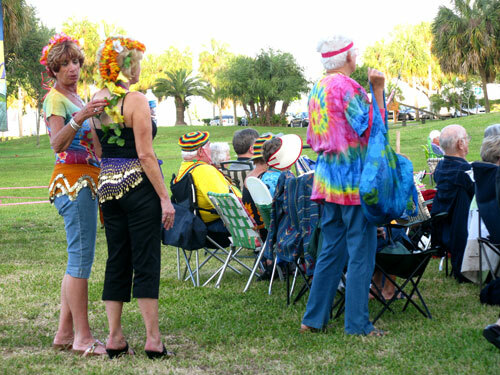 We were right, but what we were not counting on was the sight of retirees older than us dressed like Woodstock refugees and peaceniks from the 60's. talk about a "trip." This was the "Rocky Horror Picture Show" for guys on Geritol and Viagra. It was people-watching at it's best. The great thing about American Stage In The Park is that you can bring your own food and (non-alcoholic) beverages to this open-air production, and have a relaxing picnic prior to the scheduled play. 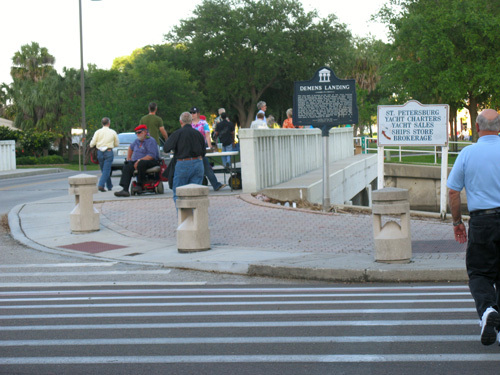 We got to Demens Landing Park in downtown St Pete over an hour prior to HAIR starting, but it still seemed like everybody in town was headed into the play. Well...almost everybody. 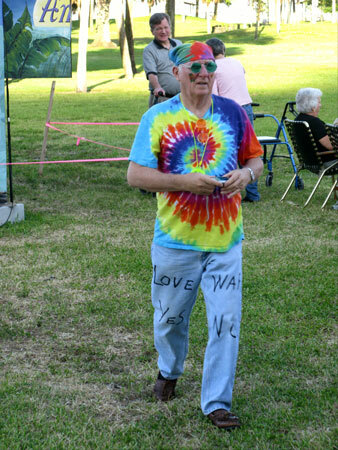 Of course, this young guy probably didn't even know what a "hippie" was, anyhow. 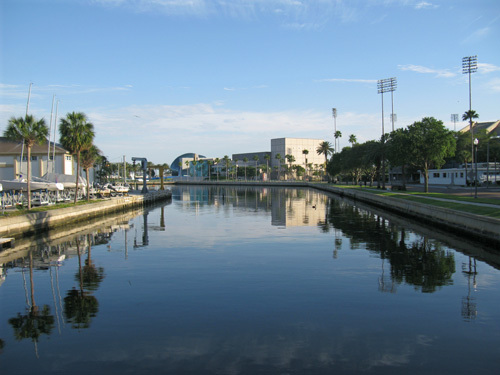 Crossing the canal into Demens Landing Park was just one more opportunity to give thanks for living in such a beautiful area like St Petersburg, FL. We saw the Demens Landing Park sign...but, inside, HAIR had transformed it into something out of Max Yasgur's dairy farm..
Music from the Country Joe and The Fish (..."What's that spell?...What's that spell?... "), Jimi Hendrix, The Who, and Creedence Clearwater Revival, Sly & the Family Stone played while people ate picnic dinners and mingled. Were we in a time warp? My girlfriend thought she knew a chick who shared a sleeping bag at Woodstock with one of the patrons. The rock musical HAIR brought out clothes people had not worn in over 40 years. Thank goodness some fashions are classic, and never go out of style. 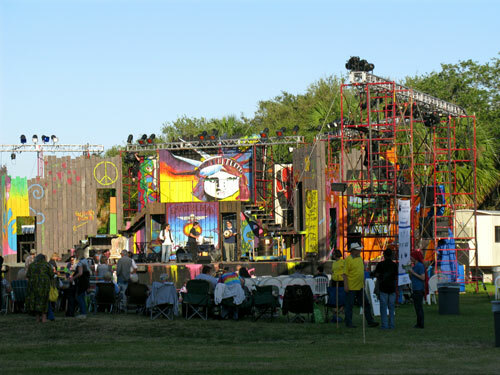 "Make Love - Not War" was the theme of HAIR...and it was evident that Viet Nam era attendees held that same vision. Of course, not everyone was a hippie...some were just real good-looking...and nothing changed much in 40+ years. 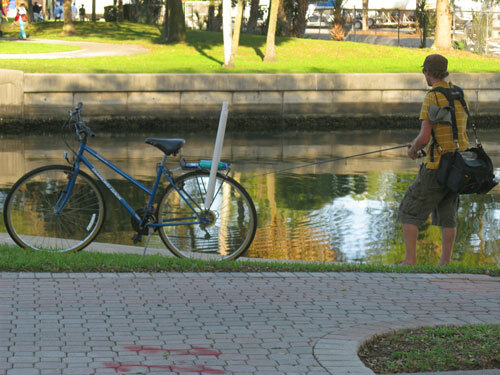 American Stage In The Park is great idea for part of your cheap Florida beach vacation. Our tickets were only $11 dollars apiece. * All ticket sales are final. There are NO refunds for bad weather. * Plan ahead, pack a good picnic dinner. * You may bring a cooler, but NO alcoholic beverages are allowed. Do NOT try to sneak them in, you'll just embarrass yourself when you get caught. 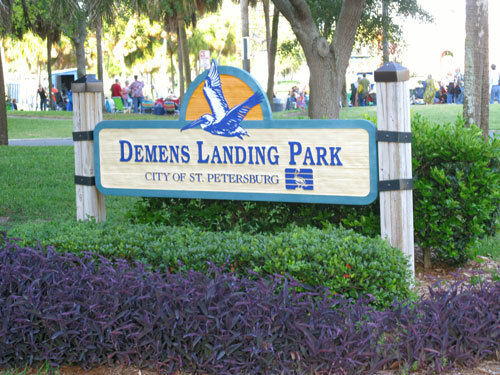 *You can purchase beer, wine, pop, and bottled water inside Demens Landing Park. *Bring your own aluminum folding chairs because the plays usually last a bit longer than two hours. * No smoking, no cell phones, no pets. * There can be NO photography of the performance. * There is a 15 minute Intermission and plenty of Port-a-Potties. * Make sure you bring a sweatshirt and light jacket. It is about 15 degrees cooler down in the park once the sun goes down because of the breeze blowing in from Tampa Bay. 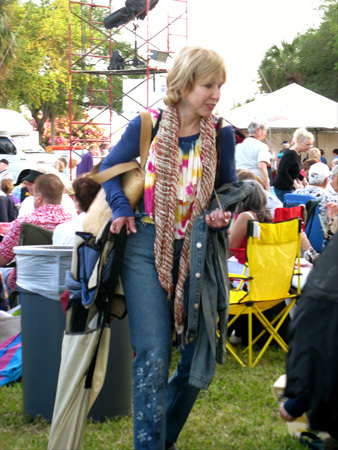 American Stage in the Park 2011 - See RENT!